Is your child GFCF? Don’t Forget to Watch Out for the GMOs Too! Like any kiddo there are many foods that my son has come to prefer over the past 4 years. Since I became aware of genetically engineered food and its potential for harm, I have become adamant that he not eat GMO-containing foods. Let me tell you this is neither easy nor pleasant for its a very tough change for my 4 year old with Autism to understand why he can no longer have his Kinnikinnick animal crackers or chocolate-vanilla sandwich cookies. What’s worse? We deal with some pretty severe picky eating and have already invested in several rounds of food therapy…making this switch even more challenging. My little guy can read exceptionally well. He’s informed me that he doesn’t want any veggies in his juice. (Already checking out the labels…) He’s begged me to bring back his Juicy Juice and even argued with me at the store telling me, “Look, it’s 100% natural for 100% kids!” Now he responds with, “Oh no! GMOooos!” Still not totally getting it, but I simply won’t budge on this one. It’s truly in his best interest to eat organic whole foods. His health has improved immensely since this dietary adjustment was made last August. He gets sick less often, has less upset tummy, and genuinely seems to feel better. I decided to contact the food companies with products my son misses most and was seriously disappointed with the results. At the very start, I don’t even understand why it’s that much harder to find GFCF foods without GMOs. The children that eat these foods already have many issues with food allergies, G. I. complications, and the like. Why would genetically engineered food be considered a good idea? 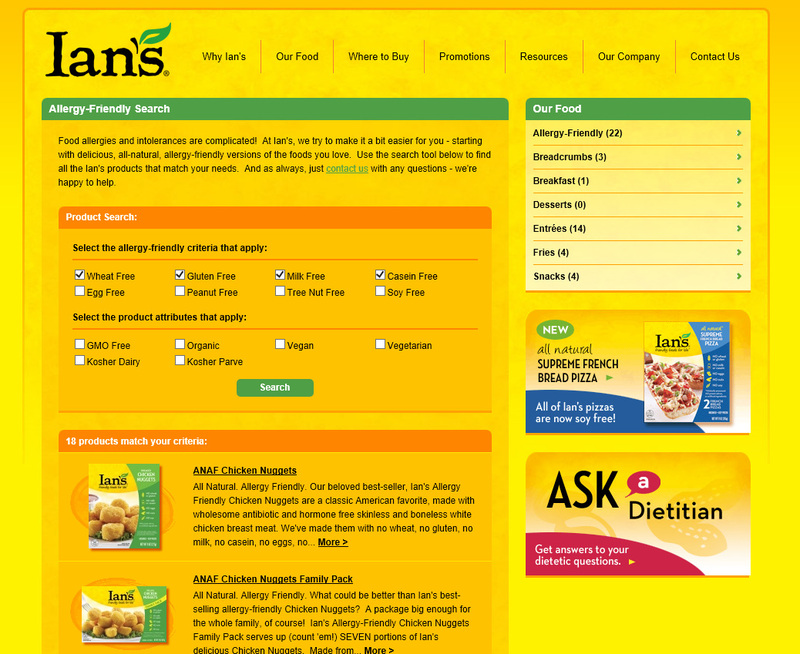 What really got me going was the Ian’s website, which allows for a convenient search by allergen. They even have a checkbox for GMO Free, and yet when I click this box in combination with Gluten Free and Casein Free the results equal a big fat zero. From 18 products down to none! Why do they only offer GMO free/organic selections for the products containing wheat, gluten, milk, etc., and not the allergy-friendly selections? 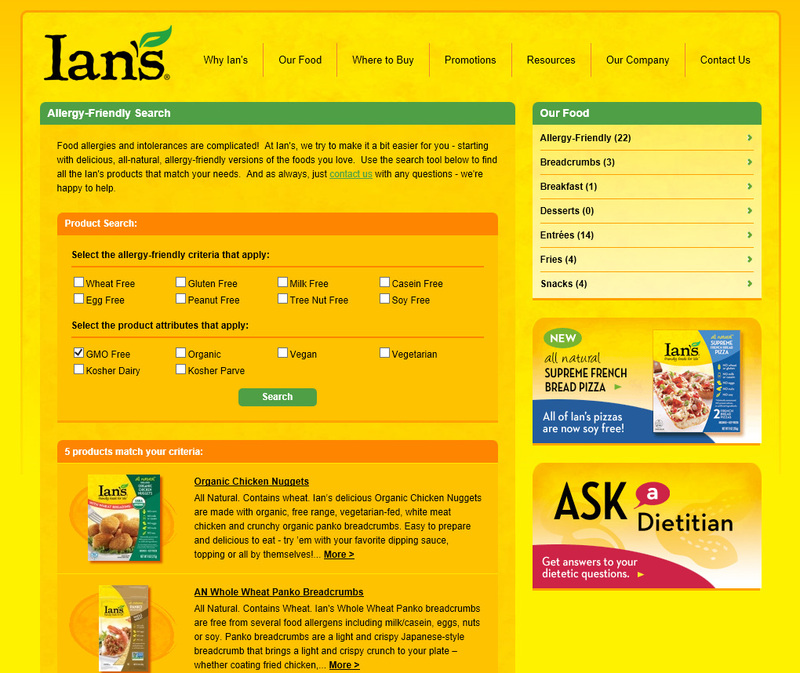 Here is the handy search page for Ian’s foods. 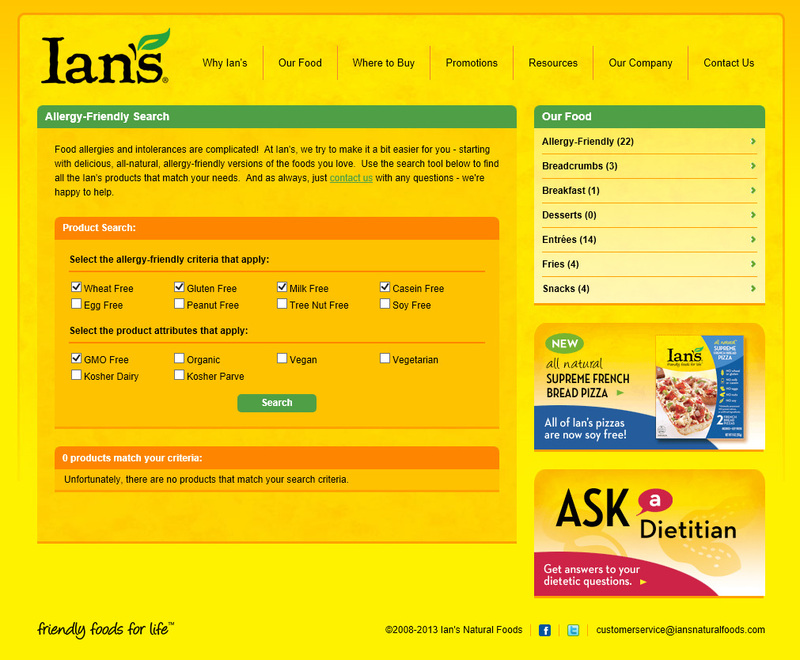 You can see that I’ve checked off 4 allergens – wheat, gluten, milk, and casein free. There are 18 products available within these search parameters. Why is it more difficult for food producers to source GMO-free ingredients for children with food allergies? There are 5 choices available – unless you’re allergic to wheat, gluten, milk, or casein. 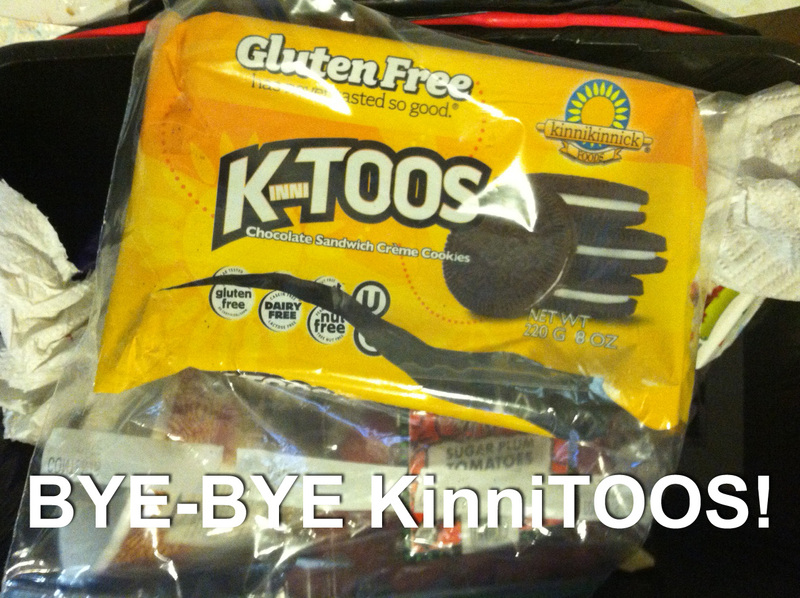 I called Kinnikinnick to discuss their foods and got a scripted response from their customer service rep. She shared that their products are 80% free of GMO ingredients and that if they do decide to change and source non-GMO ingredients it will be a long transition-likely 5 to 6 years or more to complete. She encouraged me to believe the FDA position on GE food safety and also discussed the standard-BS-rhetoric everyone seems to spew about labeling costs, package redesigns, and other complications. Oh well Mr. W, it looks like we’ll be waiting 5-6 years before we try another Kinnikinnick cookie or cracker. I was so fired up after that call that I drafted and sent an email to the president yesterday at Kinnikinnick. You can imagine how surprised I was to get a fast reply. He agreed that the labeling issues were minimal, but shared his insight to the underlying problem concerning the economics of sourcing non-GMO ingredients. Now, I understand the basic concept of supply and demand, but was disappointed at his complaints concerning premium cost for the purchase of said ingredients. I don’t know about you, but if your child is on the same diet as mine (GFCF) you’ve been paying premium prices all along. In fact, for $5.99+ for a small box containing only 10 or so graham crackers, I’m surely paying premium pricing for Kinnikinnick. Why should I feel sorry for a lucrative corporation that wishes to cut more corners under the guise of necessary profit when the health of my child is at risk?! Bah!! Work it out, and faster than half a decade people! We Mothers have become intolerant to the industry’s lackadaisical attitude surrounding the elimination of genetically modified ingredients! Now, I have several things to point out from the above statement: 1. First, here is another insider’s admission that the labeling/packaging complaints are a minor problem. 2. The awareness of GMOs and their potential for harm is spreading – so much so that this food manufacturer has provided their representatives with a script. 3. Non-GMO crops have been proven to provide better yield with increased nutrition as compared to popular GMO crops. There is no truth to the supply of non-GMO crops being less reliable than competing genetically engineered varieties. See this comprehensive info sheet for more detail from The Non-GMO Project. The President does discuss an important point regarding the need for farmers to make a definitive switch to non-GMO crops before food producers will begin switching out GMO-containing ingredients for more “real food” choices. This is an unfortunate, but true fact. However, I’d like to point out the truth that our momentum continues to grow and pressure these companies with each passing day. We simply will not give up on labeling GMOs, in fact, a large number of us want them banned entirely! 4. Any amount of GMO ingredients will not work for my son – so it’s not comforting to hear that only 20% of the ingredients are GMO. As if the presence of genetically engineered glucose (from corn-likely RoundUp Ready or BT), soy lecithin (from likely pesticide-resistant GMO soy varieties), and canola (from rapeseed – likely pesticide-resistant varieties). 20% risk is too much for me! 5. I’m still getting over my initial shock that GMO foods entered the market as early as 1992 with little notice or knowledge. I’m glad to see that this is becoming a bigger thorn to our food producers – that means we’re getting closer to that tipping point we’ve been striving for. It looks like we need to continue reaching out to one another, our lawmakers, and even the manufacturers producing our foods. We need to correct the false technical information (Like Jerry Bigam’s perception that non-GMO foods are less reliable and productive than the GMO counterparts or that a global switch to non-GMO crops might harm the state of our world. ), continue spreading awareness, and growing in numbers. For this week, I find myself back in the kitchen to plan my own homemade animal cookie recipe. 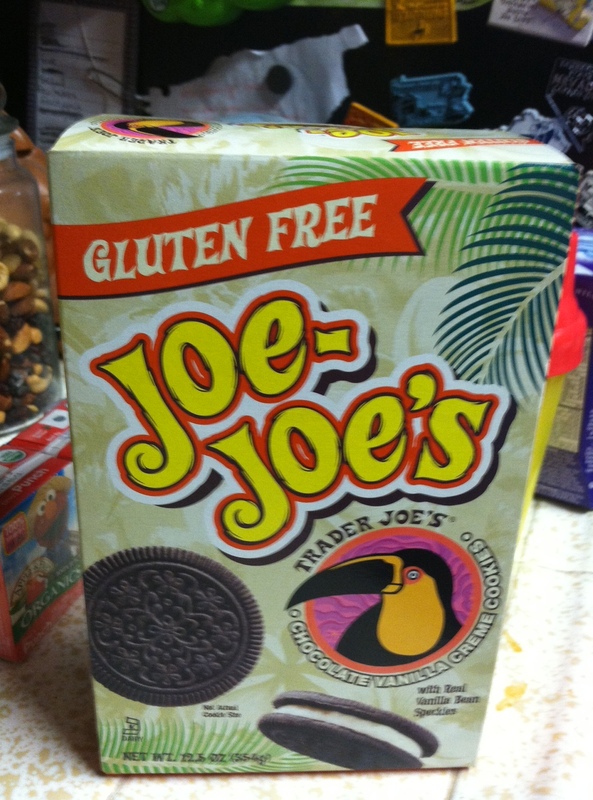 I thank Trader Joe’s for their awesome, new GFCF Oreo-style cookies to replace the old Kinnikinnick ones getting more stale by the month in my pantry. There’s no way my son would even eat his veggies without the standard, one cookie reward! Out with the Ian’s chicken nuggets and off to my local GFCF bakery with GMO info in hand. Remember to do your homework and be thorough when checking ingredients, sadly there’s more to be wary of than just the basic allergens we’ve come to live with. Visit http://www.momsacrossamerica.comand join with others helping to make positive change within our food supply. Spend some time on the Institute for Responsible Technology to learn the science and hazards of genetically engineered foods. Here is an excellent resource for GMO Myths and Truths. Contact your child’s favorite food manufacturers and tell them you’re opting out until they make this right! Loud, Rowdy, and Sometimes Unfriendly!